Hiroshima - Good Japan - Reliable Travel Information on Japan, Photos, Videos, Popular Destinations - Visit Japan. Hiroshima is a testament to the resolve, adaptability and strength of Japanese culture and society. 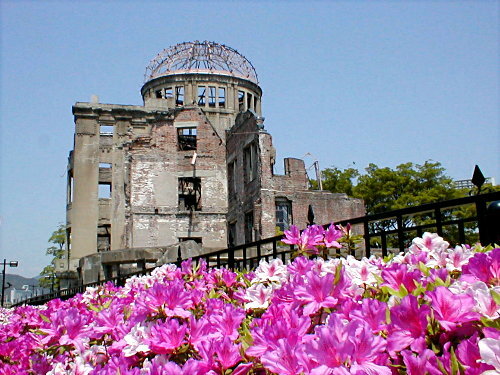 The city, once thought uninhabitable after the detonation of the Atomic bomb, has risen with a heightened vigor and beauty that is seen in the reconstruction that followed. 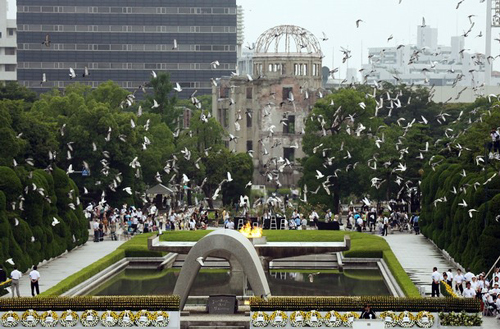 The size of the park is over 120,000 square meters, consisting of the Atomic bomb dome, the Cenotaph, and the peace memorial museum. While, the monuments are encased around a tranquil setting that truly denotes a sense of peace, the park itself is a remarkable achievement of ecology and architecture that is reminiscent to the sprawling metropolis that entombs it. Consisting of testimonies and events of the period after the dropping of the A-bomb, it records stand as a testament to the living. As one of the few buildings that remained standing after the event, it stands as a tribute to the moment in history that epitomizes the resurrection of this sprawling modern metropolis of Hiroshima. Commemorating the victims of the A-bomb, it stands across the Atomic bomb dome while the peace fire, is protected from the elements as if to shelter the souls of the victims. The epitaph that is stated "Rest in Peace, for the error shall not be repeated" Every year, more names are added. Dating back to the 17th century, this traditional Japanese garden, consisting of forests, mountains and valley's represented in miniature scale, at the same time mimicking a variety of natural formations and scenic views. Destroyed by the A-bomb, and rebuilt with a real authenticity to the original, it serves as a museum of its history and of Hiroshima. It is a five story building, with a moat that surrounds its parameter. Its extensive design and fortitude to the elements as well as its history, stands as a cultural icon that is be known throughout Japan.